Click on any picture below to watch their video. I'm 21 and I have a lot of physical issues with my body such as severe migraines, back spasms, and arthritis in the knee and leg. I just bought your bracelet, and noticed that the few days I wore it, it kept my headaches and back at bay. I hope it continues to work and help me out in all my situations. I also drink a lot of tea and noticed I've been more active and drinking water. I was in a lot of pain from me neck and back. I put the power bracelet on and my pain is gone! Thank you PowerFX! Dear Power FX, I just want to start by telling you how awesome your product is, it completely eliminated my shoulder pains from heavy free weight lifting. I was introduced to your product a few months back while my team and I were searching the vehicles entering the air field. In disbelief I volunteered to be the test subject as I was put through several tests of strengths and balance. In complete amazement, I immediately bought one as did five other of my law enforcement coworkers. I Bought 4 PowerFX Wristbands! We gave one to each of our boys (3 and 4 y/o), telling them they have special powers in the pretty circle on the back. Thankfully, they're into Batman and Power Rangers right now, and the bracelets quickly became secret radios they babbled info into all afternoon. Love it. Thanks! I really don't have a question, but rather a comment. I recently purchased a PowerFX for my husband; it was lying on the table and a about an hour or so ago, I put it on. I was in extreme pain; arthritis from two epidurals, hip and knee arthritis as well. GUESS WHAT? I HAVE NO PAIN! I purchased it from my friend Lisa from Kingsville who told me all about these!! This product really is working for me today and I just wanted you to know this. Honestly, if I didn’t feel any improvement I would not be writing to you. I am a long time migraine sufferer. I was diagnosed with migraines at the age of 14 and was started on my first series of medications. Cat Scans, MRI’s, X-Rays, and EKG’s were a steady routine for me. I would never get any answers. I was always put on a new medicine. Each new medicine would cause different reactions. Topamax made my whole body tingle. I also had a hard time speaking. Imitrex made it difficult to breathe, my neck got stiff and my chest got heavy. Depakote made my hair fall out. Desperate for pain relief I got optical nerve blocks in the back of my head. This caused my ears to ring with the sounds of static and my skull was sore for days. I was sent to neurologists, chiropractors, massage therapy, and even homeopathic specialists. Still the only answer was for me to take more medicine, and yet I received no relief. I heard about PowerFX bands and was very skeptical. After fighting a migraine for 10 days, leaving my neurologist and being put on 3 different meds this time; I decided to give the band a try. Within hours of putting on the band, I already had relief. It’s been a little over a month and I can say I have not had ANY pain. I have not had ANY migraines. I have not taken ANY pain medication what so ever. The bands have changed my life. New prescriptions, reactions, and hospital visits are now a thing of the past. I want to thank Sloane and PowerFX bands for making me pain free! I just bought an PowerFX bracelet yesterday at a local event. I immediately felt a significant difference once it was on. I have had 3 heart attacks, and take nine medications daily. I had been having heart pain just walking and thought I would need yet another stent put in, but after wearing the bracelet for just minute, I lost all pain in my heart area and had more energy then I was getting from using No-doz and other similar commercial types of stay awake medication. Thank you for a wonderful product. It has really changed the way I feel. I play the West Fl Golf Tour and Fl Players Tour and a few others. I wanted to send you a quick update and testimony to the PowerFX wristband. The first few days of wearing it, I could tell a longer amount of energy/stamina with quicker recovery while working out. I also have been religious about wearing it everyday as I play and practice. My center core balance as i play, seems to be incredibly better. I have won several tournaments since we spoke and just wanted to let you know i am pushing the bands all over the different tours. I know you and Kevin Strickler have been in contact as well. I hope all is well and look forward to hearing from you sometime. It was a pleasure meeting you at the Arnold Classic. It has been 24 hours now that I have been wearing theses wrist bands, and I swear I started noticing a difference within four hours! I could tell I went from walking bent over to being able to stand up straight again while I walked! I also noticed my back did not get fatigued as it normally does toward the end of the day. I look forward to the future and I hope the positive results continue! 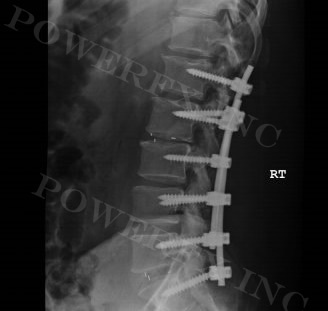 I have attached the picture of my back, it was taken two days after my surgery. Also are two pictures of my x-rays. I also have almost all my x-rays from before and after my surgeries. The only one I have not been able to obtain (and I am still trying) is the x-rays before my very first (of 4) surgeries. I bought a couple of bands at your booth in Sturgis. My wrists had been killing me from all of the riding we were doing and so I bought 2 of them to try out and see if it would help. To my surprise I think they did help my hands and wrists as I was able to continue riding without near the fatigue and strain in my arms that I had experienced earlier in the week. I continue to wear just one band and usually put the 2nd one on when I ride my motorcycle. Current customer and the band has changed my life! No more migraines or headaches... Spent $28,000 on medical Costs last year and they still had no idea... I no longer have headaches! When I was given one as a gift, I was skeptical. I was told it was not for pain but All i know is my back is not a sore since i have been wearing PowerFx. And my balance is a lot better too...Thank you! My name is Matt. I purchased a Powerfx bracelet March 8th. I have MS & prior closed head injury& stroke. Before buying powerfx I was having pain, balance issues, walking with cane, tremors, dropped foot, pain. doctor prescribed tremor meds I took once & did not like that it knocked me out. Once I put on bracelet I immediately walked better& all other symptoms disappeared. I know walk without a cane, balance better. I seem to have more energy. I would recommend powerfx to anyone. Matthew Locricchio from Michigan I do know the sun, pool exercise has also helped me to regain my strength. Being a professional musician since the age of ten. I started playing with International acts very soon. Joining The Pat Travers Band, Leslie West, Rick Derringer. The Outlaws, The Rat Race, Brian Howe (former singer after Paul Rogers for Bad Company), Lou Gramm (Foreigner) along with many others kept me going strong. After the very long Lou Gramm tour, I took a year off to take a break. Playing for 30 plus years can wear you right out. . After a year off, I was ready to go back out. In January I was in a very bad multiple roll over car accident. Was so bad I had to be flown out.. Broke many bones. Bad ones.. Was in the hospital for a long time and it took a very long time to recover. Ever single doctor and Neurosurgeon said my career was over. This is not a good thing to hear. They were looking at my Cat Scans and MRI's and not looking at my heart. When you hear this over and over, it gets you. All I wanted was some hope. After going to a care show one night with cane in hand, I see a both for Power FX. I was willing to try anything. I bought a 2 PowerFX -one for each wrist and by the time I left the car show, I threw away the cane. My career is back stronger than ever, am in the best shape of my life, can't say enough about them. Thank you for giving me the hope that I had been looking for. Some may think this is not real. I'm telling you now. I've beat my body up very bad but I feel so good and very strong. Give them a go. I'm convinced. They have worked for me and I now they will work for you as well. I bet you are surprised to hear from me so soon. I am Johni Maria Alvarado, the lady with MS you meant at the gun show in Tampa. First I would like to thank you for the opportunity to try your product, I have struggled with the the neurological part of my disease. That has been the hardest for me. As time goes on if you wish I will tell you more of the story. But on to your product, I have had them on since Sunday 2/10/13, I moved them to my ankles. Okay I do not know if it is wishful thinking but my memory seems better, my tremors better. Again it has been one day. Now I have questions tell me more about the product. How long will they last if they do work when will I have to replace them. How often should I update you on my progress. Side note Russ, I am sorry my friend tried to wheel and deal with you Sunday it is the nature of the gun show. We have a dog that is walking straight again, and not falling over. I must say I was a skeptic. I no longer am. He is the same old charlie, just prancing around. When Glenn came home from work, could not believe the difference. I owe you big time. Thanks Tim. This dog to us, is like your kids to you. I will keep you posted. I can never thank you enough.